Aside from its role as a metal or a commodity, gold is one of the oldest means of exchange known to the human race. In fact, gold has a dual role as both a commodity and a currency. Gold has amazing properties; as a metal, it is soft, dense, lustrous, brilliant, ductile, and malleable. The Neolithic period, some 12,000 years ago, marked the first discovery of gold in its natural form in riverbeds. Gold ornaments, mostly ring-shaped amulets made of hammered sheet metal, date back to the Stone Age. Throughout history, civilizations have coveted gold. Even today, gold remains the ultimate prize. Gold is not only a prize and a symbol of wealth; it is a metaphor. It's an honor to receive a gold medal, to be told you have a heart of gold or own a gold credit card. The exchange of gold bands symbolizes love and marriage in many societies. Gold is the ultimate symbol of the pinnacle of human achievement. Today it continues to be a psychological barometer of market sentiment. Gold is a rare metal. In the history of the world, mining has produced only 190,000 tonnes. The fact that governments all around the world hold gold as a foreign exchange reserve highlights the importance of the metal. Throughout history, many governments used gold to back their currencies, creating a gold standard. However, today, while governments maintain hoards of the yellow metal, none uses it to back their paper money. The U.S. dollar is the benchmark pricing mechanism for the yellow metal. Therefore, there is a special relationship between the price of gold and the value of the currency of the United States. Gold is an asset. As such, it has intrinsic value. However, that value can fluctuate over time, sometimes in a volatile fashion. As a rule, when the value of the dollar increases relative to other currencies around the world, the price of gold tends to fall in U.S. dollar terms. It is because gold becomes more expensive in other currencies. As the price of any commodity moves higher, there tend to be fewer buyers, in other words, demand recedes. Conversely, as the value of the U.S. dollar moves lower, gold tends to appreciate as it becomes cheaper in other currencies. Demand tends to increase at lower prices. Here's one way of looking at this relationship: There are approximately 325 million people in the United States, while the total world population is around 7.4 billion. Less than 5 percent of the world lives in a nation where the U.S. dollar is the national currency. The role of gold as a currency is ubiquitous around the world. While the U.S. dollar gold price is a widely accepted benchmark, 95 percent of the world must translate the value of the metal to their local exchange rates. All over the world, throughout history and today, gold is money. The ancient philosopher Aristotle wrote that money must be durable, divisible, consistent, and convenient and possess value in itself. Gold meets all of these characteristics. 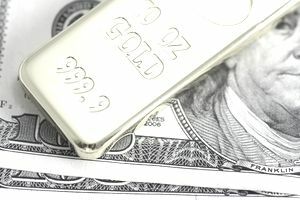 While the relationship between the value of the U.S. dollar and gold is important, the dollar is not the only factor that affects the price of the prized metal. Interest rates also affect the price of gold. Gold does not yield interest in itself; therefore, it must compete with interest-bearing assets for demand. When interest rates move higher, the price of gold tends to fall, since it costs more to carry the metal. In other words, other assets will command more demand because of their interest rate component. There is also a psychological factor attached to the value of gold. The price of gold is often sensitive to the overall perceived value of fiat or paper currencies in general terms. During times of fear or geopolitical turmoil, the price of the historic metal tends to rise as faith in governments falls. During times of calm, the price of gold tends to fall. As perhaps the world's oldest and most storied currency, gold is an important barometer in terms of global economic and political well-being.